There is no better way to increase partner and customer engagement than to add a pop of color to your everyday business documents. The Muratec MFX-3035 from Pacific Office Automation helps you do just that while also helping workflow with its long list of document processing capabilities. This machine is also ideal for an educational work setting. Schools are consistently presented with a variety of challenges when it comes to printing including creating, capturing, and grading exams and increasing document security and compliance with privacy requirements. To meet these specific needs, the MFX-3035 can use Gravic Remark OMR software to quickly create, print, distribute, capture, and grade examinations. This software lets educators select from a variety of test templates—but also lets them create their own—print the exam on plain paper (eliminating costs for Scantron sheets or bubble test forms), scan them, and have the results automatically calculated. In addition, a Scan-to-SMB feature lets teachers and other staff members scan homework assignments, exams, permission slips, and other important papers into a chosen digital archiving system. The Muratec MFX-3035 is similarly conducive to the demands of a medical work environment. This machine, despite its many functions and ample paper capacity, can fit perfectly into your typical doctor’s office or nurses’ station. In this setting, Muratec understands how important security is on a day-to-day basis. This model has achieved ISO 15408 certification at EAL 3, making it one of the most highly secure MFPs on the market today. This model also offers a keypad password, an HID Card authentication, IP filtering, PDF encryption, and HDD overwrite to make sure that sensitive material is continuously safeguarded. High Quality, Professional Output. Print and copy documents in less time and with better results using the MFX-C3035. 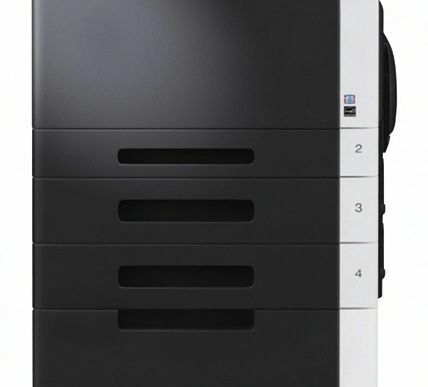 The MFX-C3035 prints and copies at speeds up to 31 ppm at 600 x 600 dpi. Fast, Flexible Scanning. Full color and B&W scanning is available at 31 images-per-minute. Scan functions include: Scan-to-Email, Scan-to-FTP, Scan-to-HDD (Scan-to-User Box), Scan-to-SMB (Scan-to-Desktop) and Scan-to-USB. Flawless Integration. Out of the box the MFX-C3035 integrates with your business solutions. The latest Windows, Macintosh and Linux drivers, PCL and PS3 emulations, and native XPS functionality handles print files in any format your network requires. PDF and JPEG Direct Printing save time by processing and printing files without opening software applications. Easy-to-Use. The 8.5" color touch screen displays thumbnails of your documents, can be adjusted to an optimal viewing angle and includes features such as the guidance key to walk users through machine operations. Environmentally Friendly Design. The MFX-C3035 is Energy Star® rated to save your company money while benefiting the environment. Also, the MFX-C3035 has a TEC value of 6.48 kWh which satisfies the stricter Tier 2 rating of the new Energy Star® standard for energy-saving performance. Flexible Paper Configurations. The MFX-C3035 comes standard with (1) 250-sheet paper cassette that support paper sizes up to 8.5" x 14". The 100-sheet multipurpose bypass tray supports postcards, labels, envelopes, waterproof paper and specialty paper. Additional paper cassettes can be added to bring the total capacity to 1,150 sheets. Advanced Security Features. The MFX-C3035 is certified for ISO 15408 Common Criteria security classification at EAL 3 – the highest level for commercially available products. You can also add powerful security options such as the HID Authentication Kit, which requires a proximity card prior to gaining machine access, and the HDD sanitizing solution which can overwrite disk drive data in eight different modes. High-Speed Faxing. 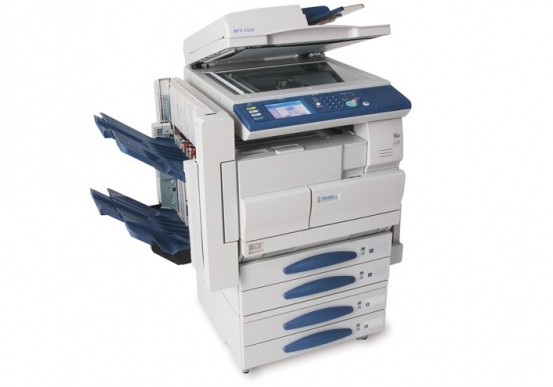 The fax is Super G3 compatible and has the ability to transmit pages at less than 3 seconds/page. The MFX-C3035 enables you to send faxes directly from a PC application, route inbound fax documents to an e-mail address, print a confirmation report and pre-register up to 2,000 locations into the address book. Dimensions ( H x W x D) 21.7" X 20.9" 20"